Use the AMRAP method to get a super-fast whole-body workout. Sometimes the most effective workouts are also the simplest. Take this AMRAP (As Many Rounds As Possible) session. The aim couldn’t be simpler: you do as many rounds of the four moves as you can in ten minutes. That’s it. Do five lunges on each leg, then two overhead presses. Do another five lunges on each leg, then two renegade rows on each side. Do another five lunges on each leg, then do ten swings. Do as many rounds as you can in ten minutes. 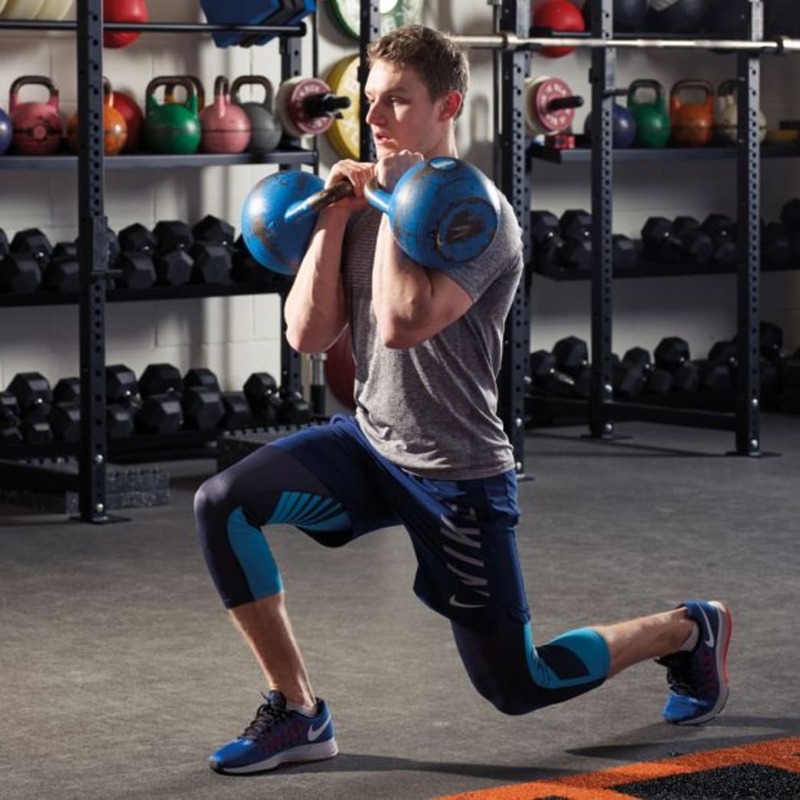 “The racked walking lunge is a great single-leg exercise that will test your core as well as challenging your breathing,” says Foxley. Start in the rack position with the kettlebells at shoulder height and your elbows tucked in to your sides for support. Press the weights directly overhead, using the most efficient path possible to minimise the stress on your shoulder joints. 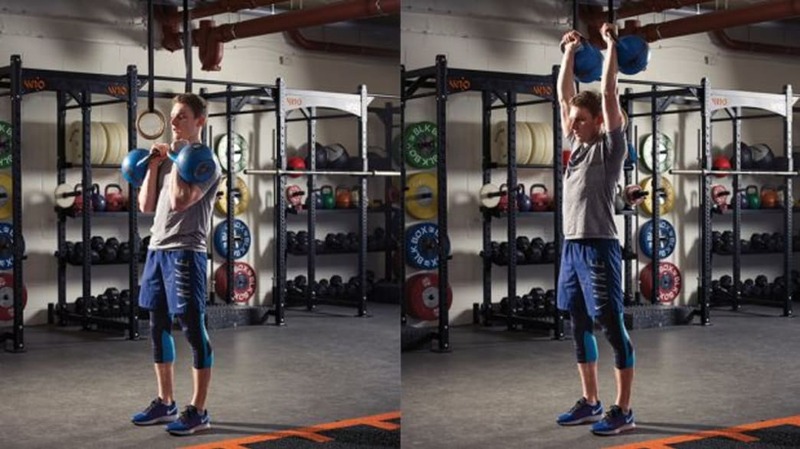 “Using kettlebells when pressing overhead allows for some rotation during the press, making it more shoulder-friendly,” says Foxley. Set yourself in a high plank with your hands on the kettlebells. Keep your feet a little wider than normal for better stability and engage your core and glutes. Row one arm up, keeping your elbow moving back towards your hips and pulling your shoulder blades together. Support your weight with the opposite side of your body. Lower the weight and repeat on the other side. Keep your core tight to stop your hips rotating. “Renegade rows are a great way to train anti-rotation [your ability to resist an external load pulling you out of alignment] for the core, as well as a pulling movement for the lats and upper back,” says Foxley. With a kettlebell in each hand, drive your hips through until you’re upright. As your arms come up, squeeze your glutes to prevent overextending your lower back. 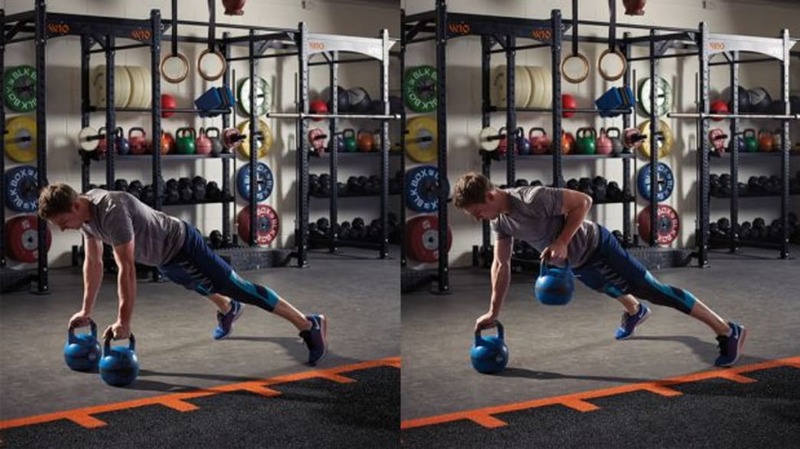 “The double kettlebell swing will keep your heart rate elevated and will also help posturally, hitting your hamstrings, glutes and lats, as well as your grip,” says Foxley.